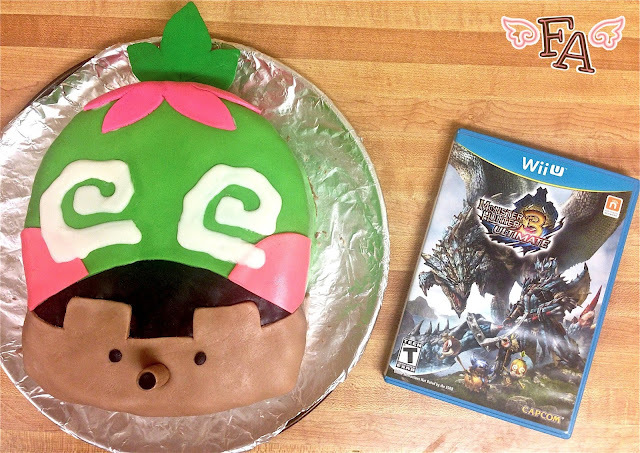 B's birthday was this past Friday so I made him a special cake--the enthusiastic little companion, Cha Cha, from Monster Hunter Tri! 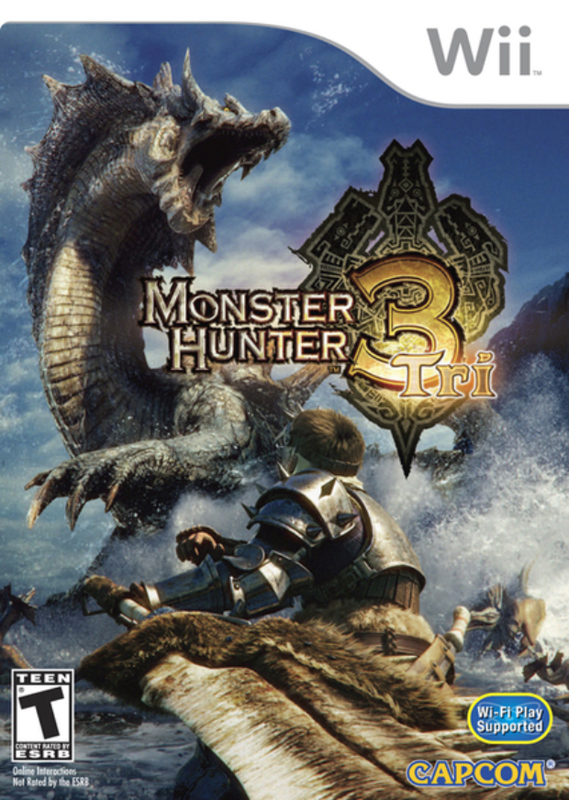 MH3 is one of B's fovoritest games, which includes the new Ultimate edition for the Nintendo 3DS and Wii U. The cake I made for him is specifically of Cha Cha's signature acorn mask. For the cake design I went mostly off of the happy chibi (cute cartoony) images that can be found for game promotion as well as the menu screen icons for both the 3DS and Wii U. The chibi traits include the happy expression, pink cheeks, and over all lack of detail. I also incorporated aspects of the in-game CGI character such as the holes in the mask jaw and the positioning of the mask "teeth". Comparisons can be seen in the second image below. ❂ Make the cakes in two 9x13 in. pans according to the package directions & let them cool completely (placing them in the freezer helps). ❂ While the cakes are cooling get out your marshmallow fondant (recipe here) & separate it into 6 balls, 1 large, 2 medium, & 3 small. ❂ Color the fondant according to the images of Cha Cha in this post or the image of the fondant pieces below. I have a certain set of Wilton icing color gels so the color combinations I used to get the--somewhat--correct colors are yellow + green for the mask face, black + brown for the mask jaw, black for the mask mouth opening, orange + pink for the cheeks, pink for the flower petal-ish mask top, & green for the leaf at the very top.❂ Cover the fondant balls in shortening & wrap them separately in plastic wrap until you are ready to use them. ❂ When your cakes are completely cool, gently flip them onto a lightly floured work surface & then carefully turn them over so that the tops are facing up. ❂ Slather a decent amount of chocolate buttercream frosting on the top of one cake & then carefully place the second cake on top, bottom up, making sure it is center. 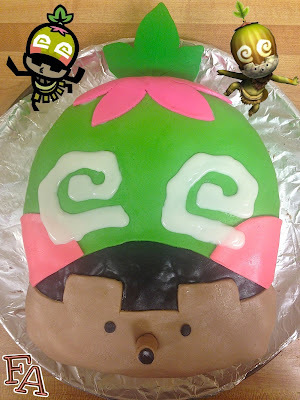 ❂ Using a long sharp knife, vertically cut along the edges of the cake to create the contour shape of Cha Cha's acorn mask (image shown right). ❂ Now it's time to apply the fondant before the buttercream stiffens. See the diagram below for the general shapes of the fondant you will need (the image is not to scale). Roll the fondant thin, like a sheet. When rolling out the fondants for the mask base (black, yellow-green, dark beige), make them about an inch or more larger than the needed size so that the ends of the fondant go beyond the bottom of the cake. ❂ Roll the black fondant & with a small, sharp knife, cut it into a wide strip that will look like a low belt when applied to the cake. Lay it onto the buttercream topped cake, press down lightly, & then gently smooth it out with your hands. ❂ Next apply the yellow-green fondant in the same manner. Roll & cut it into a shape rounded at one end (the top of the head) & slightly concave at the other end (the smile). 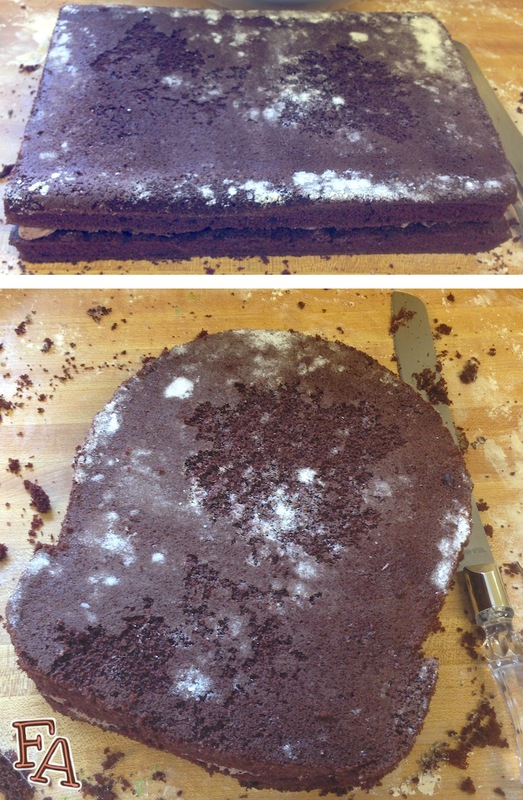 Let it overlap the black fondant a little bit when you apply it to the cake. ❂ Next is the dark-ish beige jaw of the mask. Roll & cut it rounded at the bottom edge. For the "teeth" part you can either go by the design of the cartoon Cha Cha (tooth up in the middle) or the in-game Cha Cha (down in the middle). Apply this fondant in the same way as the green fondant, letting it overlap the black. 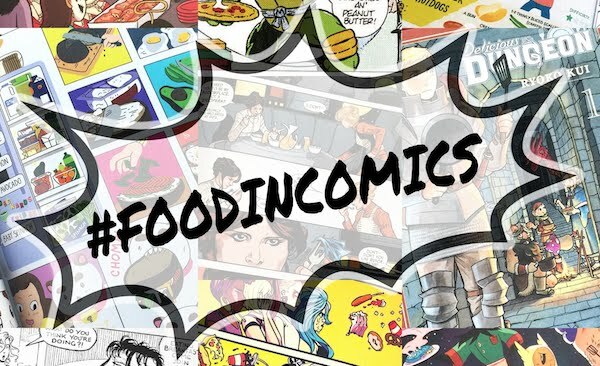 ❂ Smooth these fondants over the top & sides of the cake & cut the excess away (a pizza cutter works well for this) at a 45 degree angle from the cake base. Gently push the edges of the fondant into the cake bottom using your fingers. ❂ Roll the orangey-pink fondant & cut a circle from it using the top of your shortening canister. ❂ Cut this circle into fourths & place two of the pieces in front of you, round sides facing each other & pointy corners on the bottom. Round out the upper right corner of the piece on your right & the upper left corner of the piece on your left (so the two tops corners of the pieces will be rounded & the two bottom corners will be pointy). ❂ Using the cookie icing as glue, apply these fondant cheek pieces to the appropriate places on the cake (see images). ❂ Roll & cut the plain pink fondant into a petal shape at one end, not worrying about shaping the part that will go down the side of the cake (that can be square-ish) & apply it to the top of the cake, again using the cooking icing like glue. ❂ Roll & cut the plain green fondant into the shape of two identical three pointed leaves. 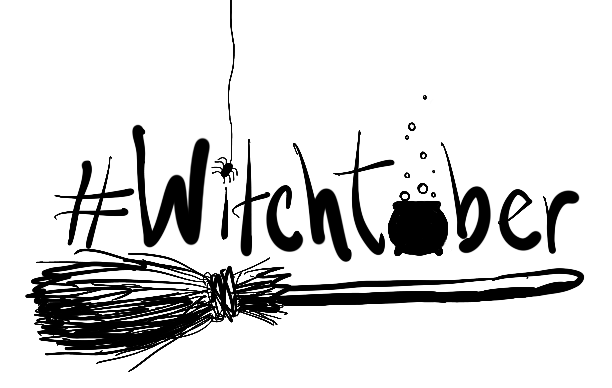 ❂ Place the non-pointy end of your wooden skewer onto the center of one of the leaves & then place one toothpick each in the center of the side points of the leaf, overlapping the skewer at the bottom. ❂ Place the other leaf on top & press down gently, smoothing the edges together so that the toothpicks & top of the skewer are sealed within the leaf fondant pieces. ❂ Carefully pierce the top side of the cake with the pointy end of the wooden skewer & slide it into the cake until the leaf is sitting snuggly against the pink fondant. 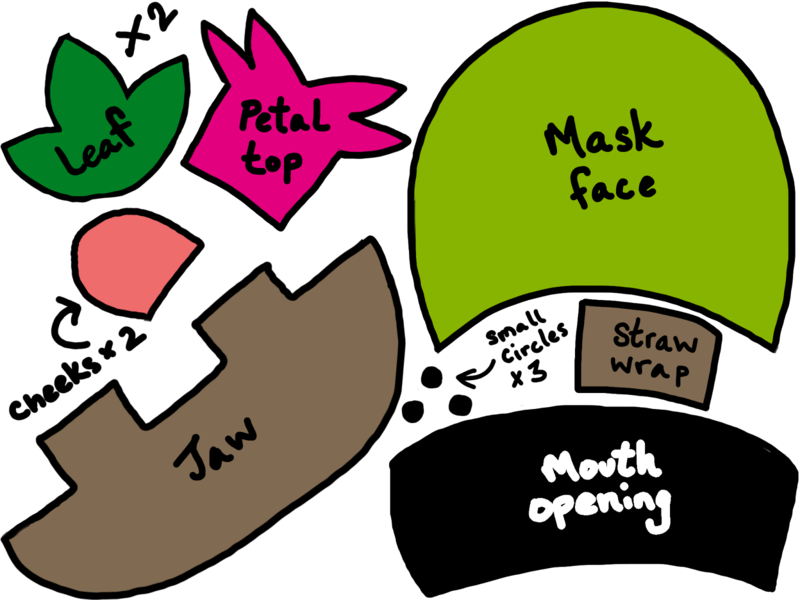 ❂ Using the straw, cut three flat circles of black fondant, press them gently between your fingers to make them a little larger & then, using cookie icing, affix two of them to the jaw of the mask as shown in the images. ❂ Next, gently press the straw into the center of the jaw to make a hole. Move the straw around so that the hole becomes a little larger than the straw. Remove the straw. ❂ Cut a 2 1/2 inch section from the straw & wrap it in a thin piece of the dark-ish beige fondant & carefully press it into the hole, leaving about an inch above the surface of the cake.❂ Using the cookie icing, apply the third circle of black fondant to the top of the fondant wrapped straw. 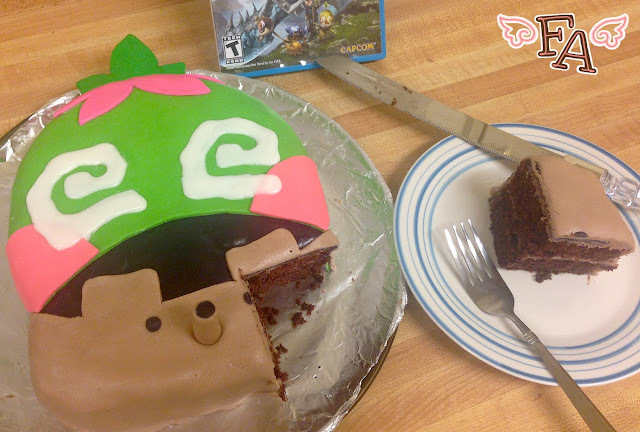 ❂ To store the cake do not put it in the refrigerator! This will cause the fondant to loose its texture when it is removed from the fridge because of condensation. 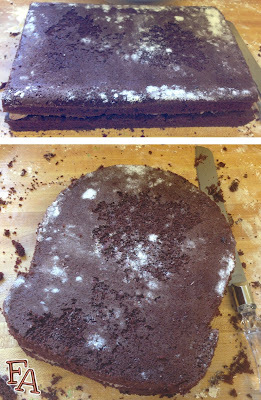 Simply leave the completed cake on the counter & cover it with a cardboard box. This way the fondant can "breath" & it will be protected from dust etc. * There will be a lot of cake cut away. Store it in a plastic container for making cake pops later (recipe soon!). ♥ If the frosting pulls up pieces of cake continue to frost the cake as best you can & then place it in the fridge so that the frosting can harden a bit. Remove the cake from the fridge & apply another layer of buttercream. This time it will go on smoother & not pull up cake. ★ You can use a toothpick to gently scrape away or push around the cookie icing to correct any mistakes.